THE business cards I got online a few years ago are close to running out. When I invest in new ones it'll be of a simpler design, with a less waffly 'message'. You see, after a few years enjoying semi-retirement, life's simpler and my ambitions humbler, writes Roy. Ageing concentrates the mind, as my latest publication The Growing Older Book makes plain. That's no bad thing and I might similarly freshen up this 'light literary' website. It was always simply intended to entertain and hopefully uplift readers, rather than anything highfalutin . . . These posts from Home will get mercifully shorter, while Ed Black (really an early pen-name I used for a couple of my books - the more risque ones) is being retired. As there are quite a number now, I will point you to favourite selections on the Books page. The Poem section will remain brief but diverse. On the Memoir page, I am simply going to run the newspaper column I still write. It will appear here on Fridays, a day after publication in my local paper, The Gazette. After all, I rarely venture on to a motorway, let alone a plane, these days and I spend far too much time as it is talking about the past. Finally, the Story/Chapter page should continue to reflect any further publications for your enjoyment. The earlier items on all pages will remain and, hopefully, still entertain. As explained before, this is a non-profit-making website from a retired journalist tired of all that bad news. Any income from our Books page links to publishers, Amazon for Kindle editions and FeedARead for paperbacks sponsored by the British Arts Council, support this venture rather than enhancing my simple lifestyle. The most rewarding aspect for me is discovering a readership in places as diverse as Argentina and the Ukraine, or Germany and the Philippines. So that's it, for now! However, I would be interested in any comments or suggestions. Here is hoping you share my earnest wish for peace and joy in life - for all of us, wherever and whoever we are. P.S. 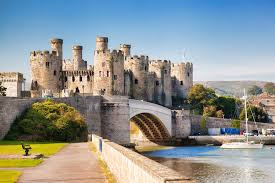 As I am travelling mostly now in my mind, the picture above is of Conway, North Wales - a setting for the next Sam Stone book which will appear sometime in summer.